The Montclair Music Studio is proud to introduce our veteran guitar instructor, Rich Campanella. Rich grew up in Nutley, NJ. He believes that one of the most important factors in studying music, above technique and reading, is the ability to become a great listener. By helping his students develop an ear, they are able to progress even more whether it be in the lesson, practicing at home, or listening to music every day. 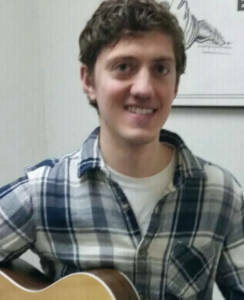 Rich has been an instructor at Montclair Music Studio since 2011 and teaches acoustic and electric guitar. He is currently accepting students on Mondays, Tuesdays, and Wednesdays. Hearing my father and my uncles play when I was really young sparked my interest in music. I was inspired by a lot of different music growing up, but I played mostly classic and progressive rock until about the time of high school. This is when I became really interested in jazz and classical music. I started out studying drums when I was about 9 and picked up the guitar a few years later. A number of my family members play music. My grandparents played professionally and taught my aunts and uncles to play when they were younger. Currently, one of my uncles is still actively performing in North Carolina and I have a cousin here in NJ who sings jazz and blues. In high school I was part of the ‘jazz lab’- a class devoted to playing jazz – as well as an after school jazz band. Drums. I also have a good understanding of complex rhythms and meters from studying Indian classical music. I have played venues throughout NJ and NYC but my focus is currently on composition and songwriting. Reading, drawing, and improving my skills in the kitchen.